Summary: Arkengarthdale is one of the less known dales. 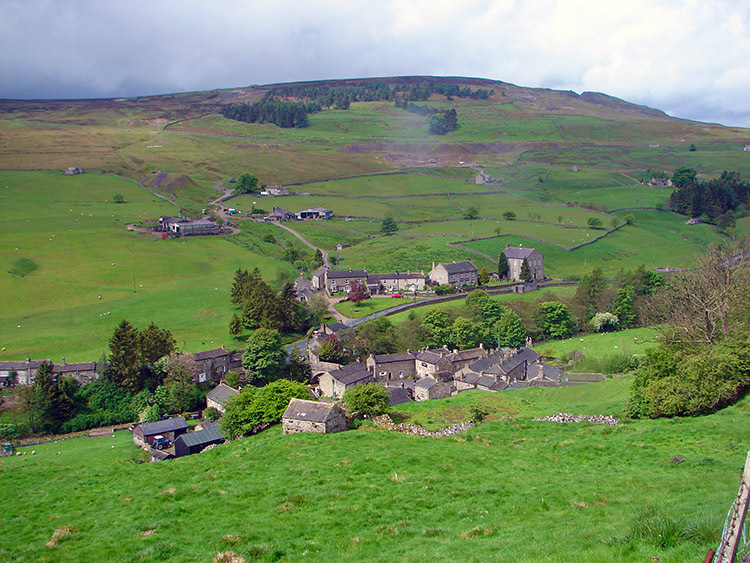 Langthwaite, the major village is found in the head of the dale, a quintessential village with a solitary pub, lovely church and a selection of houses, some in narrow terraces and some larger. 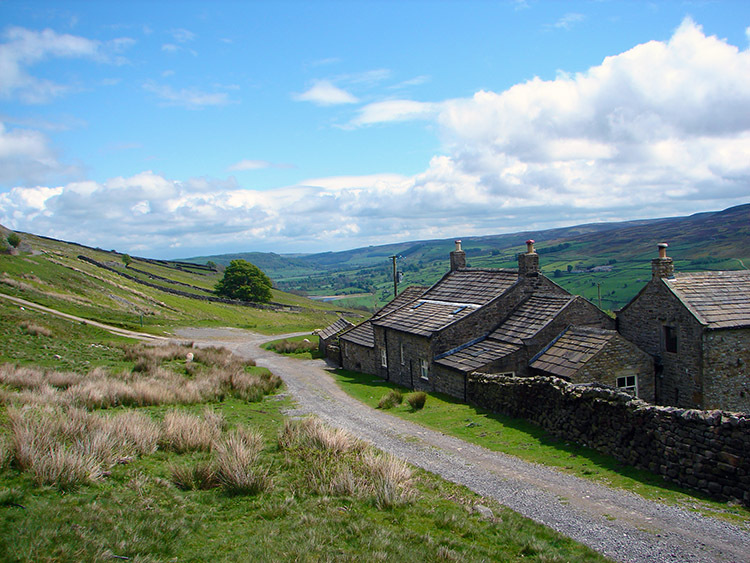 This walk visits Langthwaite after a lofty walk along Fremington Edge which provides marvellous views of the sweeping dales and on a clear day the North York Moors far in the east. After Langthwaite Calver Hill is rounded to cross into Swaledale before a finale along the riverbank and back to Reeth. The Walk: I made an inauspicious start to my walk and so I have written to the Ordnance Survey, the first time I have ever felt sufficient reason to do so. 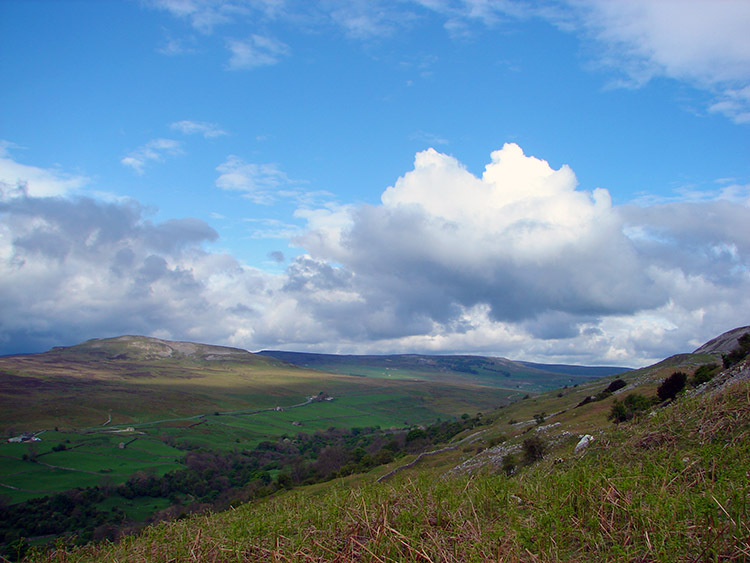 My intention was to leave the centre of Reeth and walk north along a marked footpath and then turn east and cross Arkle Beck before continuing my journey into Arkengarthdale. I did the first bit and reached Arkle Beck at the crossing point only to see a beck in good flow that was not going to allow me to cross it. 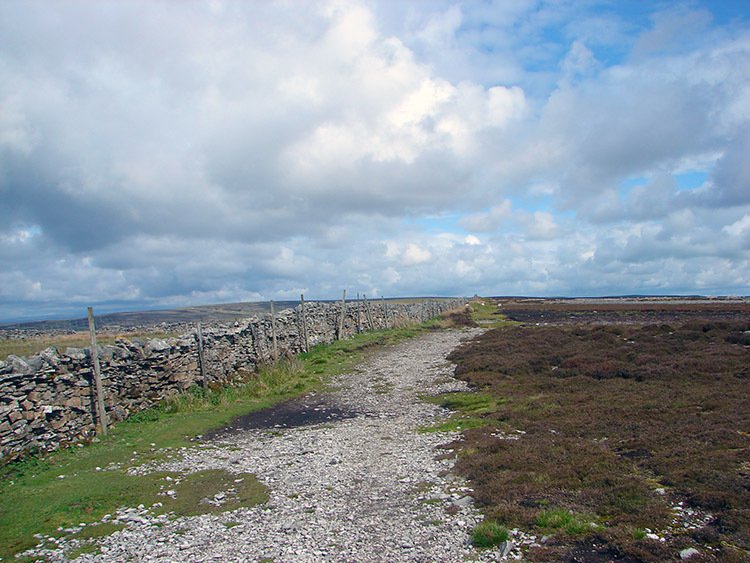 As I turned and began to trudge back to Reeth with hunched shoulders I saw an elderly lady with a dog approaching me. 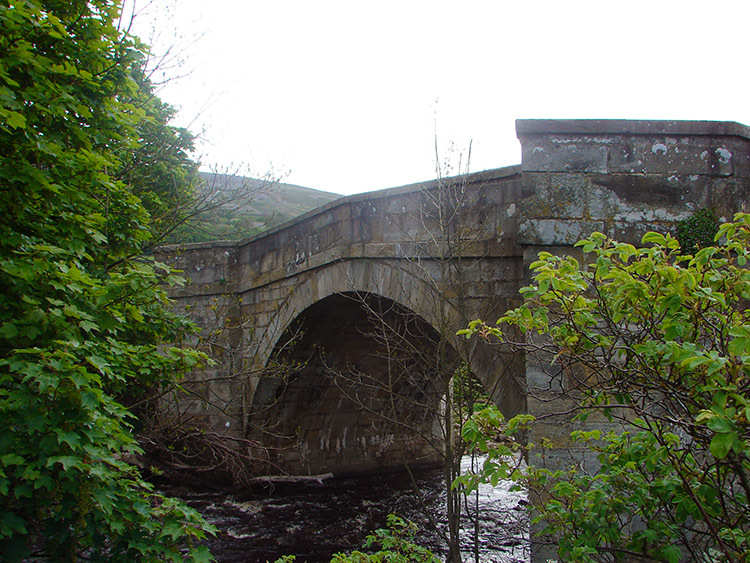 As I neared her I said "I presume the crossing point is not here anymore?" She replied "I tried to catch you, lots of walkers come this way and have to come back. There used to be a dam but it was washed away years ago". I thanked her for the information and told her that I would write to the Ordnance Survey in the hope that they might delete the path so unwary walkers would not get caught out in the future. Oh well, I had been looking forward to fording the beck. 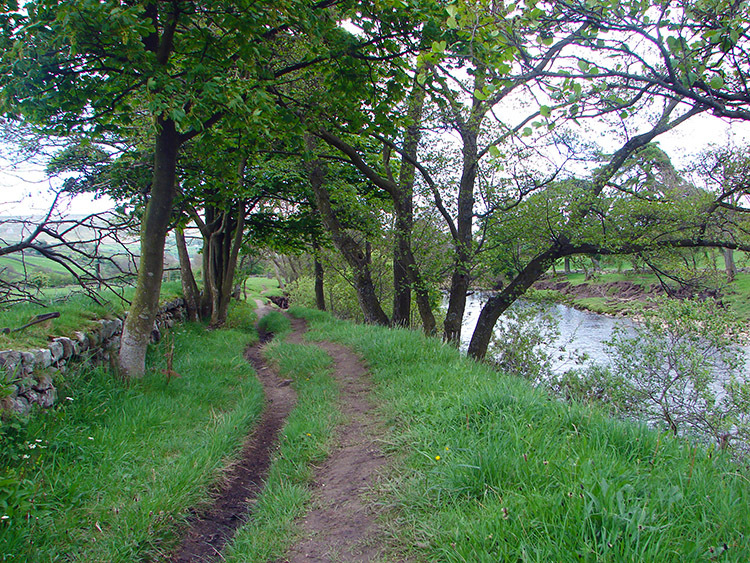 And so I reverted to option B. I walked part way back along the path and then cut down to the beck side to follow a path to Reeth Bridge. I crossed the bridge and began my walk proper by walking north along fields and through one of cows with sleepy infant calves (which I circumnavigated to leave the youngsters undisturbed) before turning north east to ascent Fremington Edge. 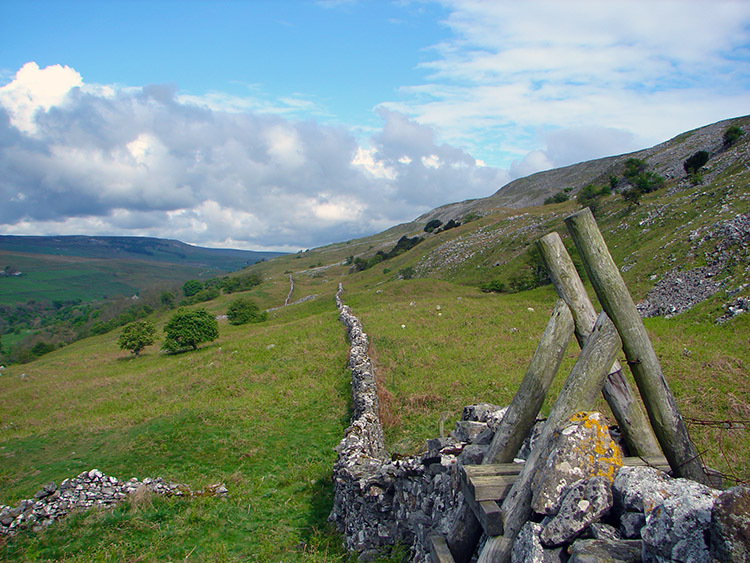 I had done this walk once before and stayed in the bottom of the dale, this time I fancied the top route and so up I went and I was soon huffing and puffing and pausing and gasping on the steep ascent of the edge. The climb was 200 metres in 600 metres walking; 1 in 3 and I felt it. I suppose the dinners I had been to during the spring events season did not help. The food and drink had taken its toll and only three weeks on from my last walk on Roseberry Topping I was panting like a decrepit steam train. At least the breaks in the climb gave me good fortune though for there were breaks in the cloud allowing canopies of sunshine to stream over Swaledale and Arkengarthdale. Reeth below me looked resplendent in the sunshine. It was to look different minutes later. After a tough time climbing the steep bulk of Fremington Edge I looked over the wonderful wide expanse of Marrick Moor. It was a beautiful scene with sunshine breaking through all over the moor and to the east where I could see the North York Moors and Roseberry Topping, my companion hill of three weeks ago. The serenity of the east was shattered when I turned to look west though. Immediately I saw the rainstorm thundering its way through Swaledale just as though it was a plague of Locusts. At first sight it was in the Keld area but moving fast and soon it spread down the dale and before long it had engulfed Reeth. I saw the market busily preparing itself for a good day when I left Reeth. I feared they were battening the hatches down now and securing the awnings. For me it was still a sunny blanket over my lofty perch. 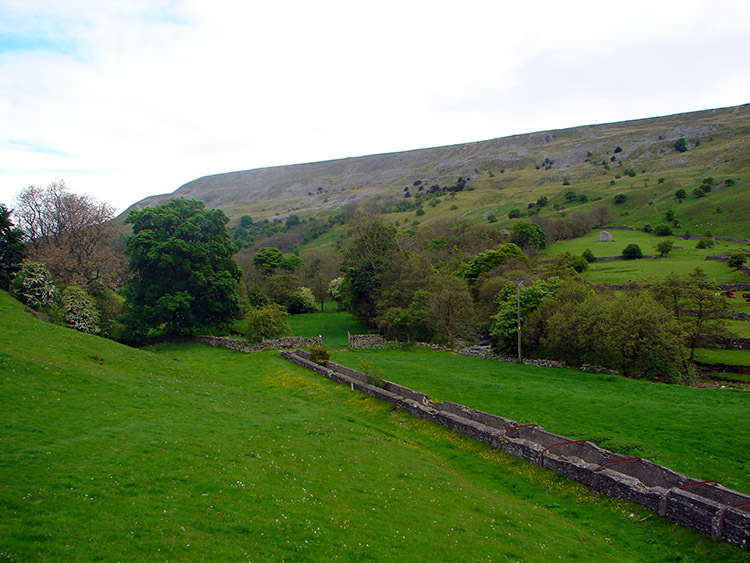 I walked along Fremington Edge enjoying the amnesty. It was not to last long. Before I go on to the impending weather I have to mention the delightful stroll along Fremington Edge for it was a lovely walk on level upland ground with far reaching views of the moors to the north, to Swaledale and Arkengarthdale in the south and west and to the North York Moors in the east. I enjoyed taking in the views for about two miles. Then the next rainstorm came my way. It arrived as a steady drizzle as I came to Wellington Shaft at Grid Reference NZ032021. Here I decided to track away from the marked path and head north east to Sleigill. The rain continued to drizzle as I made my way down off Fremington Edge into Sleigill and even abated as I reached the bottom of the gill at the watercourse. 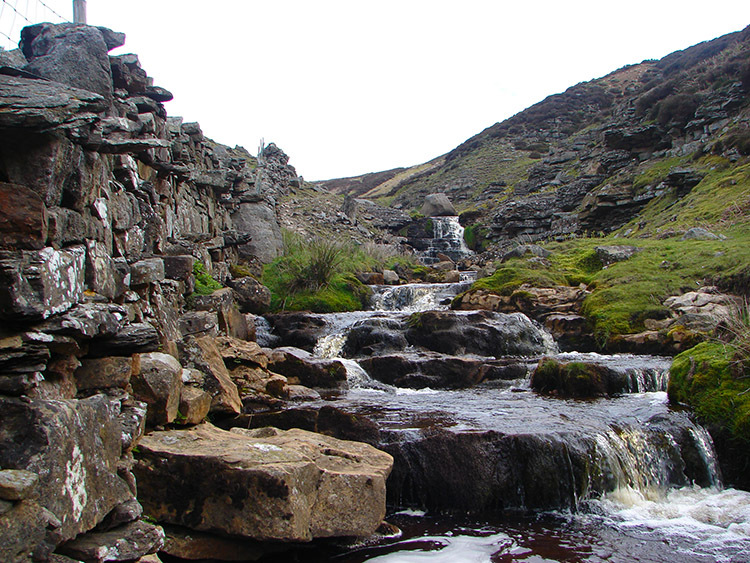 It was lovely in Sleigill with small waterfalls gently helping the water off the fell towards Arkle Beck. There were many scars though, hushes and slag heaps of old lead mining activity were scattered about. Maybe one day it will all recover but in near 100 years of inactivity the marks are still clearly to be seen. I stood by the waterside for some time, drinking in the awe of Sleigill, a lovely spot despite the man scars. Then I progressed by climbing out of Sleigill to Sleigill House, an abandoned old building by which a track led me to the sleepy hamlet of Booze. As I neared the hamlet the drizzle suddenly yielded to heavy rain. I was now in a proper rainstorm. I had donned by jacket waterproofs before leaving Fremington Edge. I had not bothered with my waterproof trousers but now the rain was heavy and my thighs were getting soaked so I stopped under a tree and put them on. Instantly I felt warmed and continued on along the road linking Booze with Langthwaite, Arkengarthdales main village. Soon I spotted the village below and as if by magic the rainstorm abated, the sun came out and Langthwaite was bathed in sunshine. The photograph above right of Langthwaite in sunshine is evidence; what is not is that five minutes earlier I had been walking in a torrent. Such is changeable British weather, a blessing really as the landscape it provides, like the one in Arkengarthdale is serene. 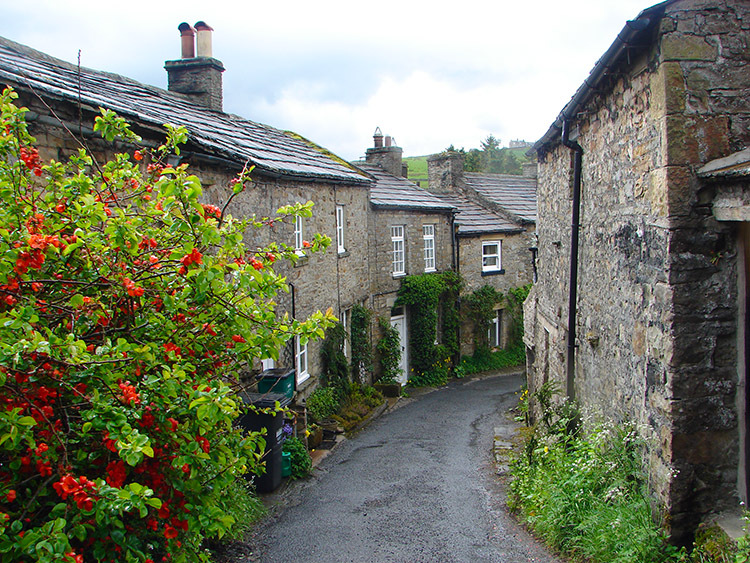 Now in dry weather I ambled down the winding road past narrow street terraced cottages into Langthwaite. On the village bridge I met a couple who were despaired about the weather for they were preparing for the Swaledale Marathon and obvious fair weather lovers. Asking my opinion the man said "What is the weather going to do, have you the latest forecast?". "Changeable", I replied adding "it will rain in some places and stay dry in others" which was the best I could tell them. Fortunately for all of us the rain was gone for the day, at least for the remainder of my walk. I stopped in Langthwaite for lunch and then walked off alongside the road to Arkle Town, not a town at all but a single row of half a dozen cottages. After Arkle Town I left the roadside onto Reeth Low Moor. On leaving the road I noticed a sign warning of ground nesting birds on the moor. It stated 'Points to consider for the very important months of April, May, June and July. Please keep your dogs on a lead. Be very careful if you leave a footpath....especially on a windy day. Think where you step. Thank you for taking the time to read this sign. Enjoy your visit'. I though the sign was appropriate, polite and not at all condescending as some usually are. The sign was definitely right in its message though for I was soon attracting the attention of Lapwings coaxing me away from their nest sites. It was one after the other for all the time I walked on the moor towards Calver Hill from which lofty point I would leave Arkengarthdale behind and descend into Reeth. Once again I chugged and chugged on the climb, not helped by my waterproof gear that I was wearing but no longer needed. I was just too intent on keeping going to bother taking it off and keep going I did to the top of the westerly summit crest of Calver Hill. Once atop the views opened out of Swaledale. The blue sky was now beating the cloud and the result was a wide rich green land spread out all along the valley floor with bright glints of sun bathed land interspersed with cloud shadows casting over a moving landscape. I was transfixed for a while with the demanding view below me. After my viewing time on Calver Hill I dropped down to Thirns and then followed a quite moor track to Healaugh village. 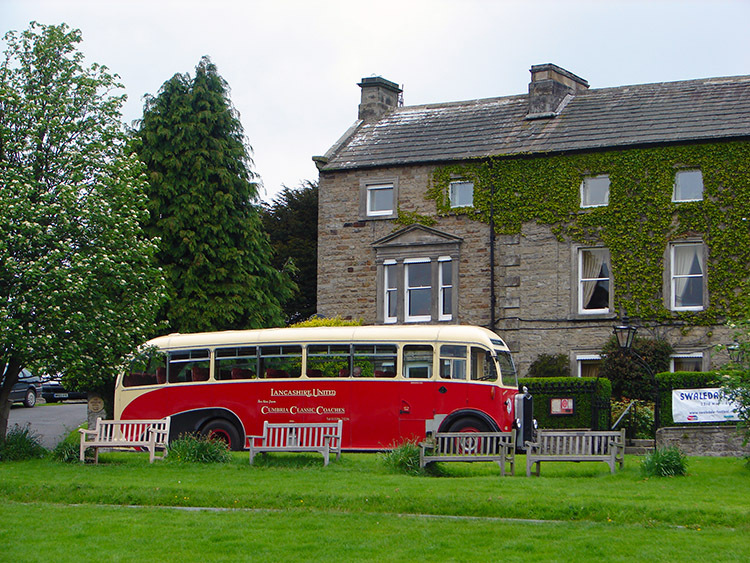 From the village I tracked down to beside the River Swale which was to accompany me back to Reeth. The river was flowing well after the rain of the day and previous days too. We had just endured a wet week but the blessing the rain left was a verdant green of grassland. Even the moors wispy grasses had looked resplendent. 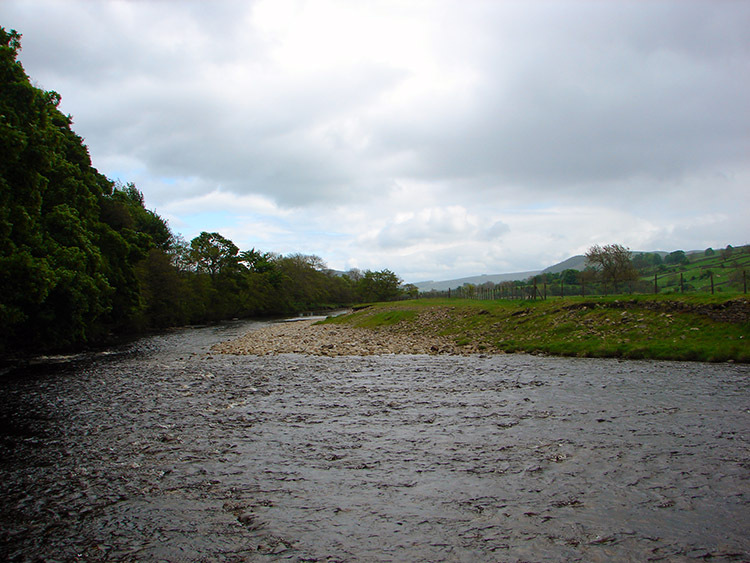 I followed the river downstream for half a mile before leaving it and walking a final half mile back to Reeth. Walking through the village streets I ventured on a young Thrush who was stood on the path and who was not too keen to move out of my way. He eventually moved aside and let me pass. I wondered if he was OK and as I did he flew. "He's OK, he's got his flying wings" I said to some passers by who were also admiring him. He was fine and so was I. Flying made his day, the walk around Arkengarthdale made mine.